Earlier today, Denver kicker Matt Prater set the all-time NFL record with a 64-yard field goal, beating the old 63-yard record (co-held by 4 kickers, including another Denver kicker). 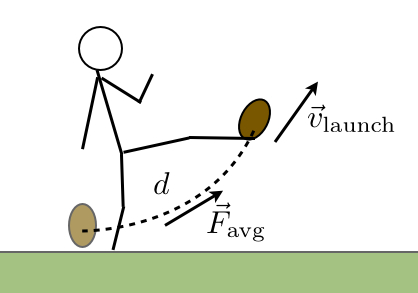 Because I’m sports nerd who did a ‘Physics of Sport’ project at University a long time ago, I honor the new NFL record-holder by digging up some of the physics a kicker (always one of the smartest guys on the field) must consider when kicking a really long Field Goal. 1) Launch Angle: It’s like a golf shot. A longer field goal needs more kicking force directed in the direction of the target, thus, a lower launch angle & trajectory. However, a lower kick is easier to block. 2) Kicking Force: To sustain that lower angle, you have to kick it much harder. A 64-yard field goal requires more than double the kicking force of a 40-yard field goal. 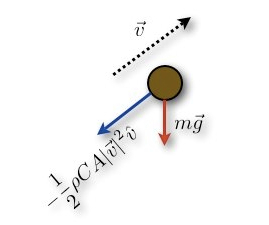 3) Air Resistance: Air resistance is proportional to [ball speed]-(squared). A longer kick requires more force. More force = Greater air resistance. i.e. much more force is required to go from 63 to 64 yards than is needed to go from 40 to a 41 yards. 4) Air Density: I found this great Wired article: “Are FGs Easier To Kick In Denver?” (see: http://wrd.cm/19aCd6b). Answer: Yes. The reduced air density does make a difference. At 55+ yards, it’s like getting a 4 or 5 yard advantage over sea-level. However, today’s game temperature makes the kick even more impressive when you consider what very cold weather does to a football, and the human foot (it was 14F when Prater made his kick). Molecules constrict, and everything feels harder – kickers say that kicking in very cold temps is like kicking a brick… with your bare foot. I tried it once, on a bet… 30 yards at 20 degrees – the upper half of my right foot was purple for 2 weeks. ← My Favorite Five. Rest In Peace, Good Sir.